If you are born into an addicted family and spend your childhood in and out of dealers’ houses, how likely are you to escape a life that’s entangled with drugs? Mark Ashby’s article (page ten) really hammers home the lack of choice some kids have – and their random chance of getting relevant support before they are beyond reach. It’s not so much ‘hidden harm’ as really obvious harm, and when the lack of dedicated support services for the young client group are highlighted, there is no justification for not catching them earlier. If adults who enter drug treatment environments and the criminal justice system are vulnerable to learning from those with more extreme habits, how much more at risk is a young person? Mark surely has a point when he points to the woeful gap in bespoke treatment units for adolescents. The Kidsco charity is about more than just steering children away from drugs. It does its best to fill fundamental holes in their lives, which could be a daunting remit when the issues they arrive with are way more adult than they are. 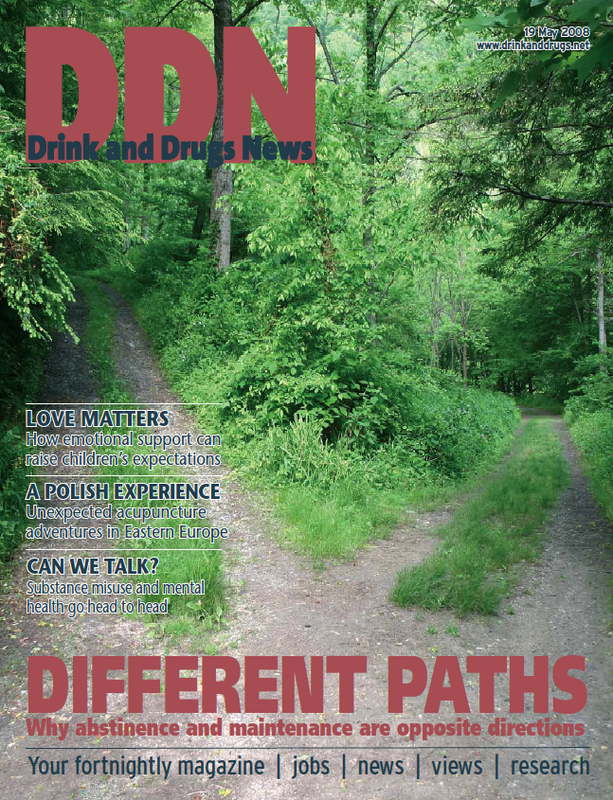 For as long as DDN has been going, we’ve printed raging arguments over maintenance treatment versus abstinence. Our cover story (page 6) has a different – and in my view important – purpose. It explains why we are often failing clients by giving them insufficient information about the likely outcomes of each treatment to inform their choice properly. Methadone maintenance suits many people and can be a very useful route to stability and reintegration. But are we making it plain to clients that it is not a logical route to abstinence, that they can’t veer easily from one mode of treatment to the other – and if that is what they are hoping for then they need to look at a different set of options for support? The four respected authors present the evidence for an argument that could shake up the current default options for offering treatment. Let us know your views.